One of the most common human parasitic infections. Causes 60,000 deaths per year, mainly in children, from playing in soil containing the eggs of large roundworms or eating uncooked food grown in contaminated soil. First sign may be the passage of a live worm, usually in the feces. Symptoms include abdominal pain, coughing, difficulty in breathing and fever. A parasitic disease commonly known as sleeping sickness. Causes fever, headaches, joint pains and itching in the early stages, then confusion, poor coordination and disturbance of the sleep cycle, as parasite invades the central nervous system. Is transmitted to humans by infected tsetse flies. Afflicts between 50,000 and 70,000 people. One of the most neglected but treatable tropical diseases. Destroys soft tissue, forming large ulcers on the legs or arms, and may invade the bones, causing gross deformities. Comes from bacteria in water, but the exact mode of transmission to humans is unknown, as is the number of people afflicted. Thirty countries have reported 40,000 cases. A parasitic infection that causes fever, swollen lymph glands, rash, diarrhea and vomiting. Irreversible damage to the heart or intestinal tract may occur 10 to 20 years after infection. Is transmitted through the feces of the reduviid bug, an insect that infests mud, adobe and thatch houses. Afflicts 16 million people, primarily in Central and South America, killing 50,000 yearly. A parasitic disease caused by eating infected raw pork or beef, or through contact with infected humans. Great majority of carriers are unaware of their infection. Symptoms are headaches, learning difficulties and convulsions. Afflicts 10 percent of the population in Ethiopia, Kenya and the Democratic Republic of Congo. Causes anemia, headaches, dizziness, diarrhea, nausea and abdominal pain. Is transmitted by 70 species of intestinal trematodes — flattened oval or worm-like animals, also known as flukes, that are typically parasites of fish and shellfish. Afflicts between 40 and 50 million people and is endemic in Southeast Asia, where eating raw and undercooked seafood is a centuries-old tradition. A debilitating and painful infection caused by a large roundworm, afflicting tens of thousands of Africans, primarily in Sudan, where the civil war is hampering efforts to eradicate the disease. The larvae is ingested in water, then develops and migrates through human tissue for a year until a blister forms and the mature worm tries to emerge. Causes such excruciating pain that sufferers can be immobilized for months. A leading cause of anemia and protein malnutrition, afflicting 740 million people in the developing countries of the tropics. Impairs physical and intellectual development in children. Is caused by skin contact with the larvae of parasites in the soil. Produces skin ulcers and facial deformities, first pictured on pre-Inca potteries from Ecuador and Peru, dating back to the first century AD. Can be lethal in visceral forms, when it attacks internal organs. Is caused by 20 species of protozoa transmitted by sandflies. Afflicts 12 million people in 88 countries. Two million new cases are estimated to occur annually, of which only 600,000 are reported. A chronic, curable disease that causes progressive and permanent damage to the skin, nerves, limbs and eyes if left untreated. Is not highly infectious, but can be transmitted by droplets from the nose and mouth in close and frequent contact with untreated cases. Afflicts 200,000 people, down from five million in 1985. First known written mention of leprosy is dated 600 BC. A parasitic disease commonly known as elephantiasis, spread by infected mosquitoes. Produces grossly enlarged limbs and external organs and causes internal damage to the kidneys. May take years to manifest itself. Afflicts more than 120 million people, 40 million of whom have been seriously disabled and disfigured. A parasitic disease commonly known as river blindness, spread by infected blackflies. Causes blindness, severe skin lesions, intense itching and skin de-pigmentation. Has blinded half a million people, primarily in West and Central Africa. Can shorten life expectancy by 15 years. Vast tracts of farmland have been abandoned in infected areas. A chronic parasitic disease that causes severe anemia, abdominal pain, diarrhea, infertility and bladder cancer. Afflicts 207 million people worldwide, 85 percent of them in Africa, where 200,000 die yearly from it. Infection occurs when the larvae of flukes, or trematode worms, penetrate human skin in contaminated water. Prevalent in tropical communities without access to safe drinking water. One of the oldest infectious diseases known to humankind. Scars the inside of the eyelid so severely that the eyelid turns inward and the lashes rub on the eyeball, in turn scarring the cornea, or front of the eye. Is caused by a microorganism that spreads from person to person through contact with eye discharge. Afflicts 84 million people, 8 million of whom are visually impaired. Is responsible for more than 3 percent of the world&apos;s blindness. Commonly known as whipworm, a parasitic disease that causes chronic diarrhea, abdominal pain, nausea, vomiting, weight loss, anemia and malnutrition. Is spread by infected flies and cockroaches. Afflicts as many as 800 million people worldwide, including up to 80 percent of the population in some regions of China and Korea. 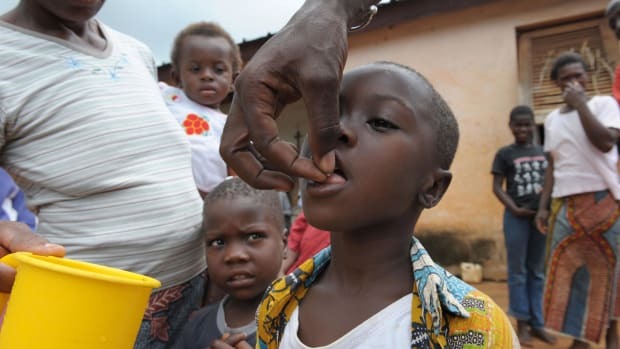 Also occurs in rural areas of the southeastern U.S.
Dr. Peter Hotez, president of the Sabin Vaccine Institute, implores the leaders of the G8 countries to focus on an easy and relatively cheap way to save more than one billion people from neglected tropical diseases. Neglected Tropical Diseases Neglected No More? World health leaders announce coordinated push to eradicate or control neglected tropical diseases. Global community must step up to fight schistosomiasis, a parasitic disease as widespread as malaria, doctors say.